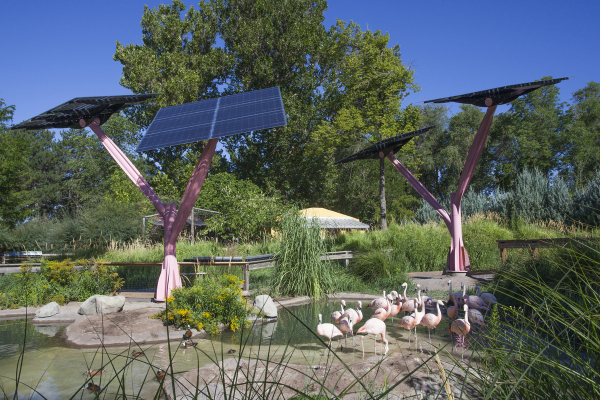 Salt Lake City’s Tracy Aviary has long been a leader in education about the natural world, and a proponent of clean energy as part of conservation. They decided that their third solar installation should be uncommonly visible and compelling. So…put it right amongst visitors and birds at the most popular exhibit – the flamingo habitat! Make it big and bright and fun – Spotlight Solar Lift structures in PINK. I have a confession: I laughed when I heard about this idea, thinking it would be over-the-top and maybe even come off as frivolous, undermining our higher purpose. I was wrong. Spotlight Solar is about helping more people learn about solar and appreciate the property owners who are using it. This installation will be seen by 150,000 visitors per year, up close and highly memorable. The ribbon cutting event brought two mayors and the press into the shade of clean energy technology, and landed it on the front page of both local city papers, reaching 200,000 people. We’d like to give credit where it’s due. Creative Energies is the well-named solar integrator who conceived of the placement, championed the idea, and got it done with excellence. They are a pleasure to work with. Rocky Mountain Power co-sponsored this project with a grant from their Blue Sky Fund (thank you to them and to their customers who opt into that program to fund development of renewable energy). And we especially appreciate Tracy Aviary’s leaders, who had the vision to bring their flamingos a novel solar system, and the courage to challenge convention. As a marketer, I also love the theme they used: Pink is the New Green. the Aviary is serious about conservation, clean energy and solar, but knows that making it fun is a great way to attract attention. We’re sure this project will entice people to flock to solar (sorry, couldn’t resist).